....where we'll showcase recipes with five (or less!) ingredients to simplify your life & time in the kitchen!!! 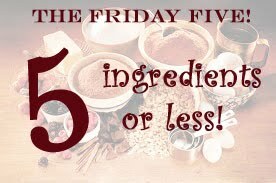 If you have a "Friday Five" recipe that you would like to contribute, then please link it to this post, or email me at unamamma1@gmail.com, and I will use it as part of our once a month guest posts! *Combine cocoa, sugar, and salt in a saucepan on low heat. *Add water and mix until smooth. *Bring mix to a boil. *Allow to boil for 1 minute, careful not to overboil. *Remove from heat & when cooled, add vanilla. This is not meant to be a thick fudge, but rather more of a syrup. Pour it over ice cream, or in a smoothie, or make chocolate milk with it!!! ENJOY! Friday Five: Crustless Breakfast Quiche! Whole Wheat Bananna Cupcakes - YUM!